The Tiff Viewer Server allows Terminal Server users to view, print, scan, batch scan, email, OCR, annotate and edit any TIFF image on the Internet, or to open and view TIFF files directly through the standalone user interface. The TIFF Viewer Server includes both a browser plug-in and a standalone TIFF document and Image Viewer. The TIFF Viewer Server is ideal for viewing, editing and printing TIFF and a variety of additional image types. The TIFF Viewer is commonly used for editing and cleaning faxes, browsing the USPTO website and viewing patent documents, scanning documents for electronic archival, processing and printing digital photos, annotating faxed documents and much more. The evaluation copy is fully functional for 15 days. Once the demo period is over you may purchase Tiff Viewer Server. Order multiple copies or a site license at a discount, visit the Black Ice Online Store for details. 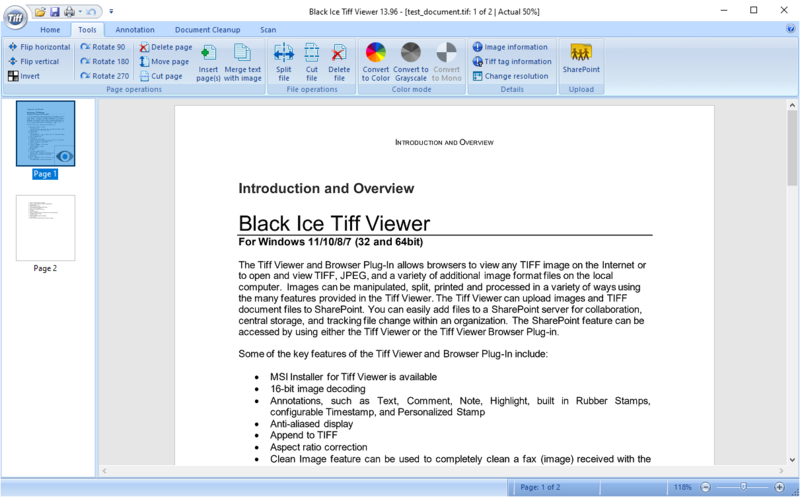 Black Ice Tiff Viewer comes with advanced PDF reading capabilities, allowing users to open eFax and Image PDF documents. The TIFF Viewer is a seamless solution to open Image PDF documents from eFax or from other online fax providers, and directly view, annotate, print or email the faxes! A new Update feature, allows Administrators to seamlessly upgrade the TIFF Viewer to the latest version on every computer, while preserving the user settings such as: View Modes, File Associations, Annotation and Stamp configurations ...etc. View, print, annotate and edit TIFF, JPEG and a variety of image types. 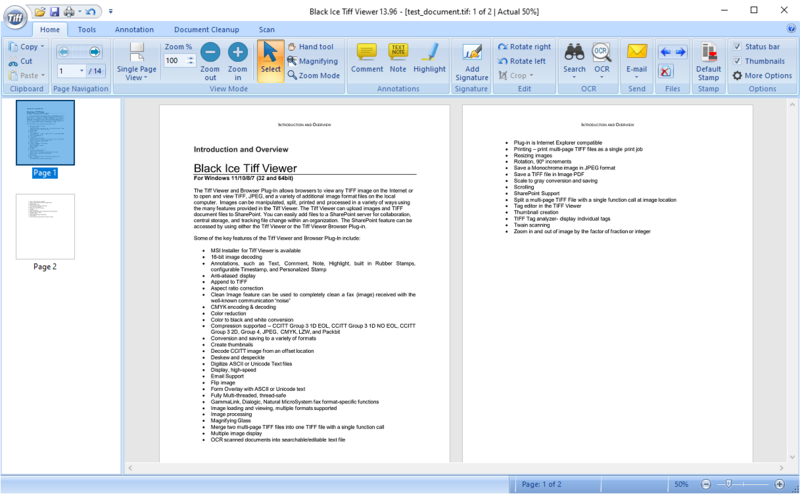 Place Comment annotations to anywhere in the document! Print TIFF documents silently with Tiff Viewer from command line! Scan, batch scan in documents and letters for easy distribution and storage. OCR faxes, sales receipts, mail or any kind of scanned documents. Search TIFF documents for text. 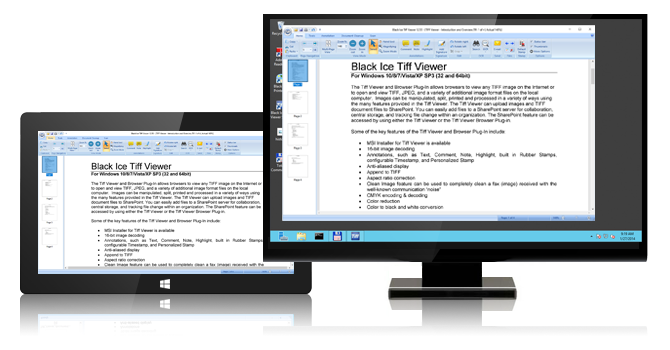 Multi-page operation for rotate, delete, flip, document cleanup and more. Send the TIFF document as Email attachment. 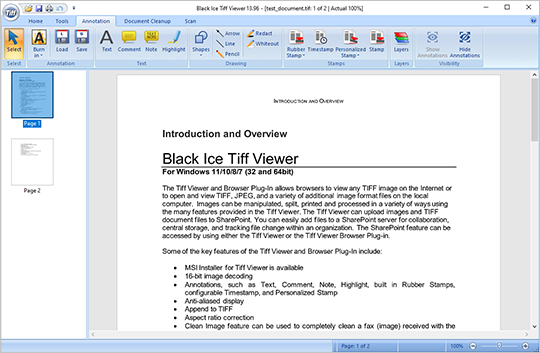 Thumbnail View of multipage TIFF documents. Manage, delete or replace pages within a multipage TIFF file. Easy method for creating and posting documents on the Web. For Windows 10/8.1/8/7/Vista/XP, please see Tiff Viewer. The	Tiff Viewer Browser Plug-in is automatically installed with the software for Internet Explorer and activates when an image is loaded in your browser. Firefox and Google Chrome users first need to install the free IEtabs plug-in for the Tiff Viewer Browser Plug-in to work with Firefox or Chrome. Looking to develop an Image Viewer or add Imaging capabilities to a web site? Click here for details on our imaging toolkits. NOTE: In the Tiff Viewer Free version, the user can apply the annotations on the pages, but the save option is not available. For Windows 10/8/7/Vista/XP please see Tiff Viewer Features. Tiff Viewer Server is licensed is licensed per server. For multiple Servers, a license is required for each server, and multiple-license discounts are available. One license is good for Unlimited users per server. The Tiff Viewer Server is licensed per server (unlimited users per server) and per CPU core. If you own a server farm, then you will need to purchase a license for each server or virtual server. Multiple server discounts available. For more information contact a Black Ice Sales Representative. The Subscription / Maintenance price is a mandatory subscription for the 1st year. The Subscription / Maintenance is a renewable(annual) subscription which entitles you to all upgrades FREE throughout the year, transferable licenses, as well as priority email technical support. At the end of the year you only need to pay the maintenance price again to continue the subscription, and you will never need to pay for an upgrade! Subscription / Maintenance Yearly renewable subscription providing free product updates (patches) and future release upgrades, and unlimited priority e-mail support for the period of the contract. Using an outdated version of Tiff Viewer? Upgrade today and receive the pricing below! Upgrade discounts are based on your original purchase date. 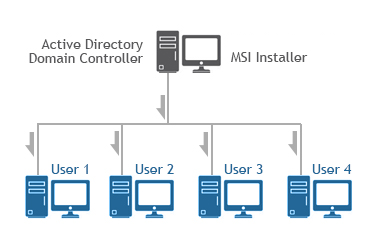 The MSI installer for TIFF Viewer designed for large scale deployment in Active Directory environments. With the TIFF Viewer MSI installer System Administrators can create custom configurations for every User on the system and register or activate the TIFF Viewer. The MSI installer will greatly simplify mess deployment and eliminates the need for customers to build custom installations. Controls the getting started dialog. Enable the Thumbnail View for multi-page documents. 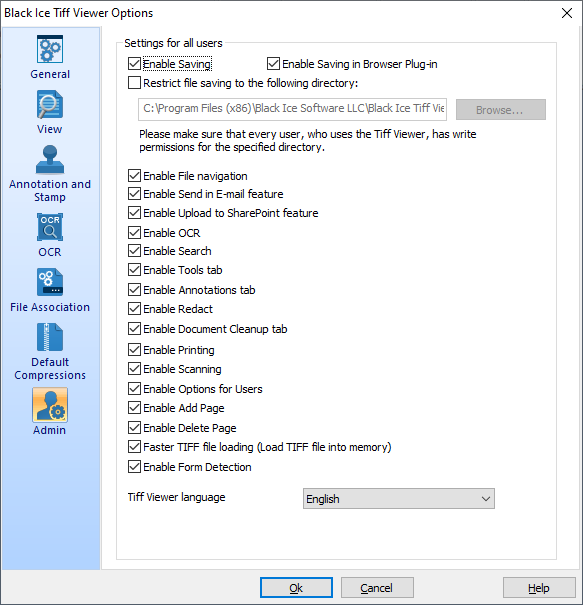 Enable Save View Setting feature. Enable Show Annotation Color Lost feature. Specifies the dithering method of monochrome (black and white) documents. Enable Send documents in Email feature. Enable Upload documents to SharePoint feature. Enable OCR (Optical Character Recognition feature. Configures the Enable loading annotation file automatically option in the Tiff Viewer General options. Enable or disable memory file. Enable or disable "Burn annotation into the image when saving the document" option. Selects the stamp type for the Default Stamp button on the Home ribbon. Selects the stamp type for the Rubber Stamp button on the Annotation ribbon. Shows or hides the date on the Timestamp. Sets the date format for the Timestamp. Shows or hides the time on the Timestamp. Sets the time format for the Timestamp. Shows or hides the minutes on the Timestamp. Shows or hides the seconds on the Timestamp. Shows or hides the time zone on the Timestamp. Specifies the text of the Timestamp. Specifies the position of text on the Timestamp. Specifies the alignment of the timestamp text relative to the date and time on the Timestamp. The absolute path of the application to open OCR documents. The language of the OCR. The absolute path of the directory to save the OCR files. Enables or Disables the Center the Image Vertically option on the Print dialog of Tiff viewer. Enables or Disables the Center the Image Horizontally option on the Print dialog of Tiff viewer. Enables or Disables the Scale to Fit Page Proportionally option on the Print dialog of Tiff viewer. Enables or Disables the Use Image DPI option on the Print dialog of Tiff viewer. Enables or Disables the Stretch to Fit Page option on the Print dialog of Tiff viewer. Enables or Disables the Print annotations option on the Print dialog of Tiff viewer. This option configures the default View Mode of the Browser Plug-In. Enables or Disables the Stretched to Fit Page option in TIFF Viewer Browser Plug-In. Enables or Disables the Center on Page option in TIFF Viewer Browser Plug-In. Configures the Default Printing Mode in TIFF Viewer Browser Plug-In. When this option is 1, the Tiff Viewer will always remember and use the previously used batch scan directory. Specifies the default scan directory where the batch scanned documents will be saved. 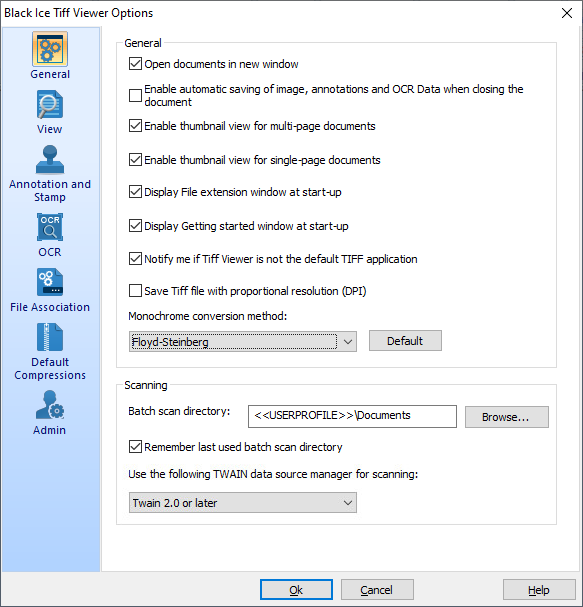 Twain data source manager selection allows users to select which data source manager version must be used for scanning.